With so many classic Seinfeld episodes it is hard to choose a favorite. This is a t-shirt based after the Seinfeld episode called “The Little Jerry”. Little Jerry is a rooster that Kramer has in the ring and ready to fight. 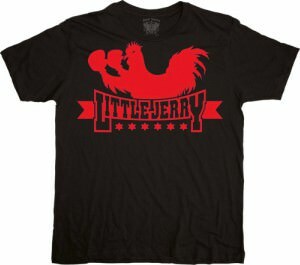 On the front of this all black t-shirt you see the red silhouette of a rooster wearing boxing gloves. Also find the saying in all capital letters of “Little Jerry” along with red stars. 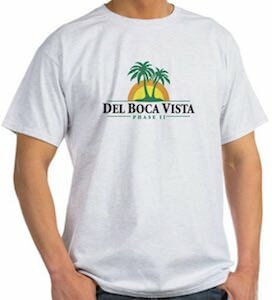 Made from 100% cotton to be very durable and last a long time. While also super comfortable and soft to wear. This t-shirt is available in a wide selection of sizes that range from Small to 3XL. Is Kramer you favorite Seinfeld character? 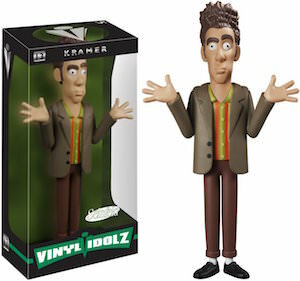 If he is then you are in luck because now there is this amazing looking figurine of Cosmo Kramer. This is an 8 inch figurine in the Vinyl Idolz series and it is number 13. Kramer looks like you expect him to look with his arm in the air with his hands up just like we all have seen him do a million times. Besides the hands the clothing and his facial expressions are spot on making him just the perfect addition to your Seinfeld collection. Kramer also comes in a nice windowed box so that you can keep him in new condition if you want. When Kramer accidentally receives the wrong license plate he tries to figure out who’s it is, and what exactly it stands for, and with help and the classic Kramer style he gets to the bottom of it. On the front of this navy blue shirt you see this license plate from the television show Seinfeld, find a New York plate with the Statue of Liberty and the license plate number of “ASSMAN”. Available in a wide variety of unisex sizes that range from Small to 6XL and made from 100% cotton giving you a soft yet durable tee for any occasion. And it comes in many colors too. Seinfeld was always so funny to watch and even though it’s not longer being made we keep getting flash backs to this amazing comedy. And now there is this mug that will make it so much easier to start your day with a smile. 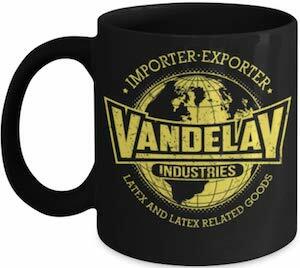 It is a simple white ceramic mug with on the front the Seinfeld logo and on the back the text “It’s a show about nothing” in red print. 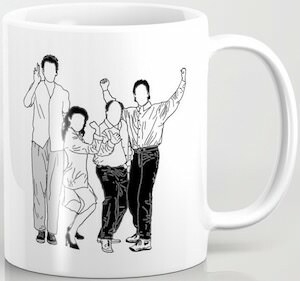 This 11oz Seinfeld mug is a perfect mug for you coffee at home or at the office and everyone know that you like to laugh so maybe the keep all the bad news away from you. Everyone that has seen an episode or two of Seinfeld all know about George Costanza and the problems he has or gets in to. Remember the episode where they are waiting in a Chinese restaurant and maitre de scream “Cartwright” a couple times and of course nobody response but that was his way of saying Costanza so George missed that important phone call from Tatiana. 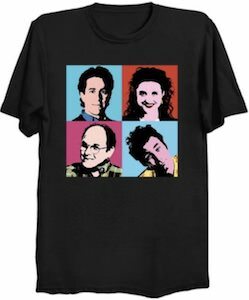 Now you can get a t-shirt that show a picture of George Costanza but with the name Cartwright spelled on it and yes that means that only a true fan of Seinfeld will understand this shirt. Made from 100% preshrunk cotton this t-shirt with George on it is nice and comfortable and available in sizes Small – 3XL. 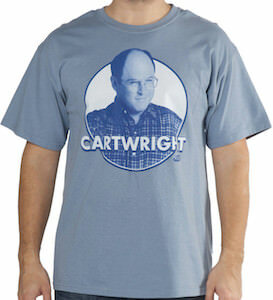 Now you can tell the world all about Cartwright just by wearing this Seinfeld T-Shirt. Have you ever needed a comeback right on your t-shirt so you don’t have to waste your precious verbal skills on somebody. Well here it is, this is a comeback that George Costanza from the hit TV comedy series Seinfeld uses when he had nothing else to say. 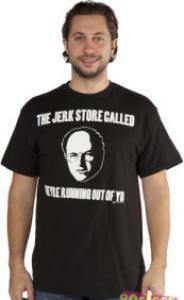 On this Seinfeld t-shirt find a black and white head shot of George Costanza with the saying “The Jerk Store Called…They’re Running Out Of You”. This will be a very durable and comfortable t-shirt that is made from 100% cotton and can be found in a wide variety of sizes. Get your hillaroius Jerk Store Seinfeld T-Shirt.